Teofilo (Kevin Manning, farside) and Holy Roman Empire (Mick Kinane) treat the huge crowd to a stirring finish in the Dewhurst Stakes. Teofilo came out top in an epic duel with his old adversary Holy Roman Emperor in the Darley Dewhurst Stakes at Newmarket. Jim Bolger's colt had won their first meeting in the National Stakes quite easily, but it was much tougher this time as Teofilo - named after Olympic boxing legend Teofilo Stevenson - just managed to preserve his unbeaten record. The 11-8 favourite, ridden by Kevin Manning, got the verdict by a head, with Strategic Prince two and a half lengths back in third. The £250,000 Group One Darley Dewhurst Stakes (4.10pm) sees 15 of the best two-year-olds in Europe go to post. This is the second-largest field since 1945, just one less than the 16 starters who lined up in 2002. With the likes of unbeaten Irish challenger Teofilo, ante-post favourite for the Stan James 2000 Guineas next May and rated by his trainer Jim Bolger as a possible Triple Crown contender next season, Aidan O'Brien's Holy Roman Emperor, second behind Teofilo at the Curragh before winning the Group One Prix Jean-Luc Lagerdere at Longchamp, Peter Chapple-Hyam's undefeated Hamoody and dual Group Two winner Strategic Prince all engaged, it is certain to be the best juvenile race of this season and potentially the strongest for several years. Stars of the future will be on show in the £250,000 Darley Dewhurst Stakes on Champions' Day at Newmarket on Saturday, October 14 (4.10pm) which has attracted 25 confirmations. Teofilo, unbeaten in four starts and talked of as a possible future Triple Crown contender by his trainer Jim Bolger, is still engaged in the seven-furlong contest and is one of a dozen possible Irish contenders. Aidan O'Brien, seeking his second Darley Dewhurst Stakes success following Rock Of Gibraltar five years ago, has nine to choose from including Holy Roman Emperor, second to Teofilo in the National Stakes at the Curragh before landing the Group One Prix Jean-Luc Lagardere at Longchamp on October 1. Heading the home challenge for the Darley Dewhurst Stakes is Hamoody from the Newmarket yard of Peter Chapple-Hyam. Hamoody is unbeaten in two starts, having followed up on his debut success at Newmarket's Ritz Club July Festival victory in the Group Two Richmond Stakes at Glorious Goodwood. Chapple-Hyam, who won the Grade One Shadwell Middle Park Stakes with Dutch Art on September 29, will be out to land his second Darley Dewhurst Stakes following on from the success of subsequent Derby winner Dr Devious 15 years ago. Eoghan O'Neill reports his stable star Vital Equine to be on track for the Darley Dewhurst Stakes. O'Neill revealed this afternoon: "He works tomorrow and then I'll discuss things with the owner's racing manager, Geoff Lucas, but he's on track and Richard Mullen will ride." The high-class Danetime colt won his first three starts, including the Group Two Champagne Stakes over seven furlongs at York on September 9, in which he defeated subsequent impressive Group Two Juddmonte Beresford Stakes victor Eagle Mountain by half a length. Vital Equine went to Longchamp for the Group One Prix Jean-Luc Lagardere at Longchamp on October 1, when he suffered his first defeat in finishing a fine third to Holy Roman Emperor. The Angmering Park handler reported: "I was really pleased with his Longchamp run and he's come out of that race well. We're just delighted to have a horse that competes at Group One level. "I wouldn't have any worries about the ground - he goes on anything. It was soft when he won at York and he performed well when it was on the firm side at Longchamp, so he's pretty versatile." Class 1, Group 1, £250,000 Total Prize Fund. For 2yo entire colts & fillies, 7f. 4.00pm, Newmarket, Saturday, October 14. Weights: colts 9st 1lb; fillies 8st 12lb. Entries closed August 9, entries revealed August 15 (135 entries - 1 entry not qualified), forfeit-stage September 26 (54 remain), five-day confirmation and £15,000 supplementary entry stage October 9 (25 remain), final declaration stage 10.00am, October 12. 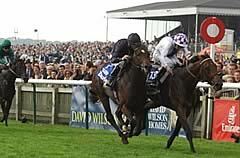 Form figures supplied by Weatherbys & are correct up to and including the racing of Sunday, October 8, 2006. Simon Callaghan, son of trainer Neville, this morning revealed that the exciting two-year-old Excellent Art is a possible starter in the £250,000 Darley Dewhurst Stakes over seven furlongs. After coming third to Holy Roman Emperor and Dutch Art on his previous two outings, the Pivotal colt got his head in front with a battling short-head victory over Doctor Brown in the Group Two Mill Reef Stakes over six furlongs at Newbury on September 16. Callaghan commented: "Excellent Art has come out of his last race at Newbury very well indeed and we are very pleased with him, although he is not a definite runner. We are certainly considering the Darley Dewhurst Stakes though, and I would say that it is 50-50 whether or not he runs at this stage. 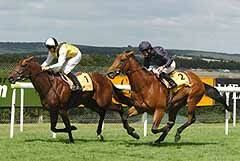 "His form with the likes of Dutch Art and Holy Roman Emperor is standing up very well. He is a very good horse and we have been keen to step him up to seven furlongs for a while now - there are no doubts about him staying the trip. "He's very versatile as regards the ground, having won on good to firm and heavy going, although he wouldn't want a very fast surface. Being a son of Pivotal, I think good or slightly easier ground would suit him best. "We'll consider the Stan James 2000 Guineas at Newmarket next season but we'll just have to see how he is working in the spring. The German and French Guineas could also be possible targets." The totesport Cesarewitch and Darley Dewhurst Stakes are two of seven races on a superb programme that makes up Champions' Day at Newmarket on Saturday, October 14, also featuring the £350,000 Group One Emirates Airline Champion Stakes. Group Two action comes with the seven-furlong VC Bet Challenge Stakes and the 'In The Pink' Rockfel Stakes over seven furlongs for two-year-old fillies, while the Group Three David Wilson Homes Jockey Club Cup over two miles and Group Three Unicorn Asset Management Darley Stakes over nine furlongs complete the card. Peter Chapple-Hyam reveals today that his exciting juvenile Hamoody heads next to Newmarket for the £250,000 Group One Darley Dewhurst Stakes on Saturday, October 14, raising the prospect of a mouth-watering clash with Irish stars Teofilo and Holy Roman Emperor on Champions' Day. The son of Johannesburg is unbeaten in two outings over six furlongs, following an impressive win on his debut at Newmarket's Ritz Club July Festival with a battling head victory over Bodes Galaxy in the Group Two Richmond Stakes at Goodwood on August 4. The Newmarket trainer said today: "Hamoody definitely runs in the Darley Dewhurst Stakes. "He's in top form and I couldn't be happier with him. I really can't wait for the Dewhurst to come! "The step up to seven furlongs will certainly suit him and I wouldn't mind if there was any ease in the ground. He's one of those horses that goes on any surface - it all comes the same to him." Chapple-Hyam, who landed the contest in 1991 with subsequent Epsom Derby hero Dr Devious, also numbers recent impressive Group One Shadwell Middle Park Stakes victor Dutch Art among his juvenile team, but the two will not be squaring up in the Darley Dewhurst Stakes. He continued: "He and Dutch Art will most likely have to meet at some stage in the future but hopefully I can keep them apart for a bit longer. It's very pleasing to have two such good two-year-olds in the yard. "Hamoody is a miler who may get a mile and a quarter in time. The Darley Dewhurst will be a very hot race but I'm looking forward to it." The Group One Darley Dewhurst Stakes is one of seven races on a superb programme that makes up Champions' Day at Newmarket on Saturday, October 14, also featuring the £350,000 Group One Emirates Airline Champion Stakes. Group Two action comes with the seven-furlong VC Bet Challenge Stakes and the In The Pink' Rockfel Stakes over seven furlongs for two-year-old fillies, while the Group Three David Wilson Homes Jockey Club Cup over two miles, Group Three Unicorn Asset Management Darley Stakes over nine furlongs and the fiercely competitive £150,000 totesport Cesarewitch Handicap over two miles and two furlongs complete the card. The £250,000 Group One Darley Dewhurst Stakes, run over seven furlongs at Newmarket on Champions' Day, Saturday, October 14, has attracted 135 entries, including 48 from Ireland and one from France. The largest entry is provided by the powerful Ballydoyle yard of Aidan O'Brien, successful in 2001 with Rock Of Gibraltar, who is responsible for 41 entries in total. They include the ante-post favourite for the Stan James 2000 Guineas, Holy Roman Emperor, a decisive length and three quarter winner from Coventry Stakes hero Hellvelyn in the Group One Phoenix Stakes over six furlongs at the Curragh on August 13, and Duke Of Marmalade, a neck second to Strategic Prince in the Group Two Vintage Stakes at Goodwood on August 2. Last year's victor Sir Percy went on to take the Vodafone Derby in dramatic fashion in June, and his trainer Marcus Tregoning has the unraced quartet of Ajhar, Aqaleem, Atraas and Seteem engaged. Mark Johnston, trainer of 2004 scorer Shamardal, has 14 entries including dual-winner Champery. Sir Michael Stoute has 10 entries, among them Leopard King, a promising second on his debut over six furlongs at Newmarket on August 4, and Henry Cecil has a single entry in the once-raced Many Volumes. Hamoody made it two wins from two outings in the Group Two six-furlong Richmond Stakes at Goodwood on August 4, while stablemate Dutch Art shares an identical profile having landed the Group Two Norfolk Stakes over five furlongs at Royal Ascot on June 22. Their trainer, Peter Chapple-Hyam, sent out Dr Devious, the 1992 Epsom Derby winner, to take the Dewhurst in his juvenile year. Paul Cole, who landed the prize back in 1990 with future Epsom Derby hero Generous, has three entered, including his Group Two TNT July Stakes and Vintage Stakes winner Strategic Prince, and Barry Hills, looking for victory number four in the Dewhurst after Scenic (1988), In Command (1996) and Distant Music (1999), has eight entries, with Thousand Words looking the pick after winning both starts. Sandwaki, trained by Carlos Laffon-Parias, has won all three starts to date over five furlongs, defeating subsequent Group Two Prix Robert Papin hero Boccassini in a Group Three contest at Maison-Laffitte last time out, and is the sole entry from France. Other fascinating contenders include Teofilo, trained by Jim Bolger, who maintained his unbeaten record in a seven-furlong Listed event at Leopardstown on July 29, the Geoff Huffer-trained Cockney Rebel, a winner on his only start over six furlongs at Newmarket on July 22, and Furnace, trained by Michael Bell, successful on his debut over seven furlongs at Newmarket on August 11. Class 1, Group 1, £350,000 Total Prize Fund. For 2yo entire colts & fillies, 7f. Newmarket, Saturday, October 14. Weights: colts 9st 1lb; fillies 8st 12lb. Entries closed August 9, entries revealed August 15 (135 entries), forfeit-stage September 26, five-day confirmation and £15,000 supplementary entry stage October 9, final declaration stage 10.00am, October 12. Form figures supplied by Weatherbys & are correct up to and including the racing of Monday, August 14.